Limited quantities of ready to ship available. Difusers purchased now will ship out on December 3rd. Wear your favorite essential oil anywhere! Beautifully crafted, this exclusive Courtney Marie Jewelry design has been cast in sterling silver and antiqued to highlight the unique heart and arrow design on the front. 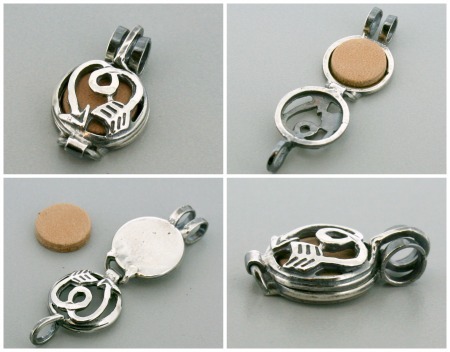 This locket style pendant opens to hold a round leather disc that 1-2 drops of essenatial oil can be placed, the trick is to let the oil sit and soak in for a minute before wearing your diffuser. The front cover of the diffuser is open around the design to allow for the oil to diffuse throughout the day.